The survival mode takes place in a new map called the Glittering Caves and it also features new units to face off against. Rather than take on hero units, it looks like players fight bigger and badder enemy mobs with the action broken up by several boss waves. 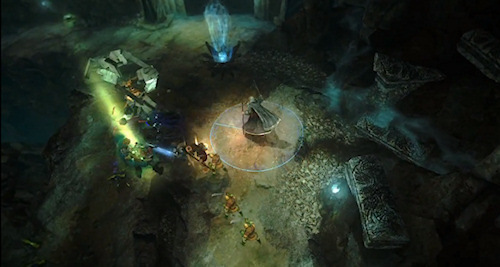 Survival in Guardians of Middle-Earth is playable online in five player co-op and is included with the game's season pass. There's no date set for the content other than it'll be available "soon." In addition to the new survival mode there's a new skin for the one lane map called Goblin-town. The dark and dreary map looks similar to the new Glittering caves maps but features a bit more atmosphere. This map skin will be free with an update to Guardians of Middle-Earth. Of course it still remains to be seen of Monolith can fix some of the network issues that continue to plague Guardians. It's a rare night that I'm able to get a complete match in without the game dropping due to network connectivity issues - and when a match does work - a lot of times it is lag filled and almost unplayable. This disappoints me greatly because during pre-release play on public Xbox Live the game was smooth and played extremely well.